Researchers studying fossilized animal bones from the Dikika region of Ethiopia have found evidence that Lucy’s species, Australopithecus afarensis, used tools to butcher meat. 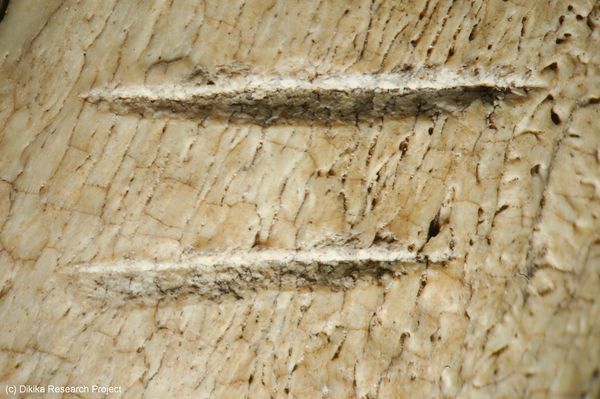 The bones had marks from cuts, scrapes and scratches made when the bones were fresh. Forensic analysis found stone fragments in one of the cuts. Before this study, paleontologists thought hominids of the Homo species first used tools 2.5 million years ago, but the A. afarensis bones date to 3.2 million and 3.4 million years ago. Lucy and her kin were also previously thought to have eaten a vegetarian diet, but if they were butchering animals to the bone, they were eating the proceeds. Study co-author Zeresenay Alemseged, the palaeoanthropologist from the California Academy of Sciences in San Francisco who leads a large research effort in the region, said that the find overturns much of what was thought about A. afarensis. “For 30 years, no-one has been able to put stone tools in their hands, and we’ve done that for the first time,” he told BBC News. There are still some holes that need filling in, though. The sample of bones was small and no tools were found on the site. We don’t know if A. afarensis picked up convenient stones to use as tools, or if they were advanced to the point of actually crafting cutting tools out of larger stones. We don’t even really have direct evidence that it was Lucy’s species doing the butchering. The bones were dated by dating the volcanic rock in the area where they were found, and it’s the date that points to A. afarensis because as far as we know there were no other hominid species in the Dikika region 3.2 – 3.4 million years ago.